For aging baby boomers now at the core of the Oregon Shakespeare Festival’s audience demographic, the acronym may bring back memories of riding in hand-painted school buses with Ken Kesey or waking up in a teepee in upstate New York. Ah yes – the 60’s. 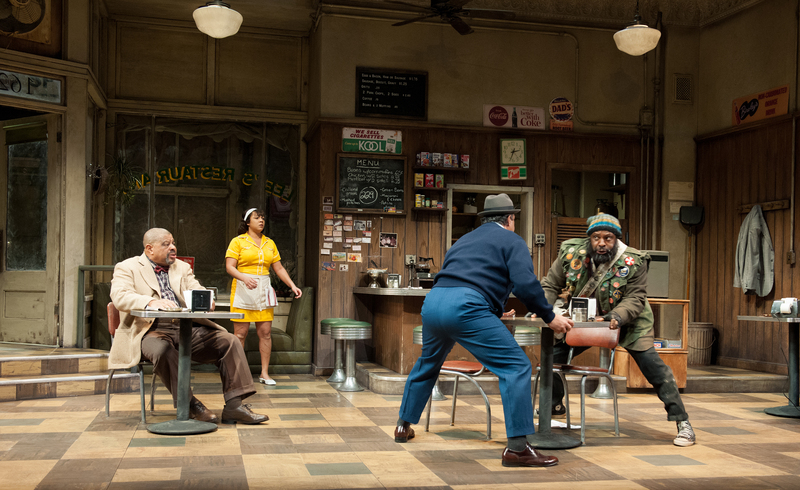 But for anyone who has seen director Lou Bellamy’s 3-plus hour version of TWO TRAINS RUNNING by August Wilson, one of the four opening shows at OSF this year, a new definition for the hallowed counter culture code other than lysergic acid diethylamide seems apt: Long Slow Drama. For while there can be no doubt that it is drama, it runs to a length, and at a pace, that often challenges the audience to stay tuned in to this lyrical playwright’s vision. Memphis (Terry Bellamy) and Wolf (Kenajuan Bentley) come to an understanding. Photo by Jenny Graham. 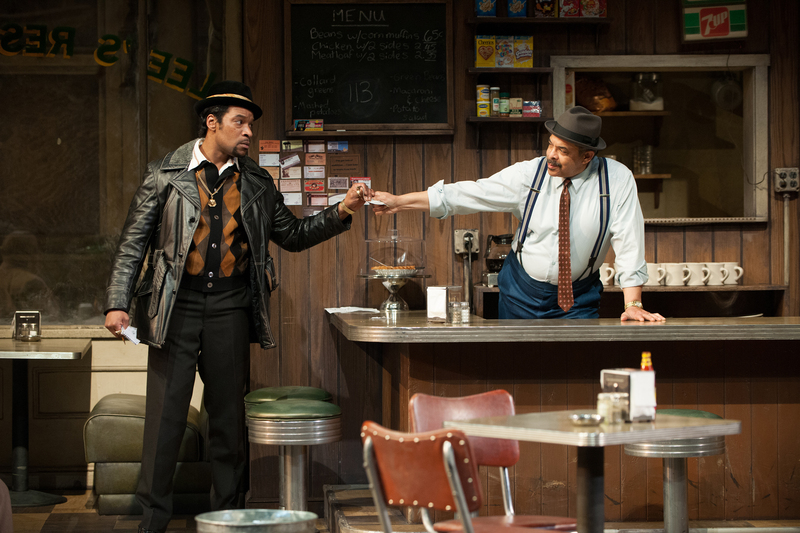 In Wilson’s cycle of ten plays covering the African experience experience in the 20th century, TWO TRAINS takes place in the pivotal year of 1969. But there’s no tie dye or acid or other trappings of the establishment’s rebellious children recognizable in this 1969. The setting is an inner city diner in Pittsburgh’s predominantly black Hill District. We watch as characters old and new come and go, assert themselves, and struggle to make decisions driven, and sometimes owned by, the fast-changing world beyond the front door. The style is mostly straight ahead naturalism – except for the mention of Aunt Ester, one of the presences looming over the entire cycle. For she is several hundred years old. Into the diner’s circle of regulars comes Sterling (played by the always fascinating Kevin Kenerly), who is just out of prison and looking for a future. Unfortunately, in this particular time and place, there’s not much on offer for him or many of the other characters. There’s a familiar real estate / development plot line in the background not unlike the one found in Wilson’s last play, RADIO GOLF. The future is coming, and the diner (and symbolically any consideration for the local African American community) will likely be raised. How then does Memphis (Terry Bellamy), the owner of the rundown place, realize a fair price for his slice of America? 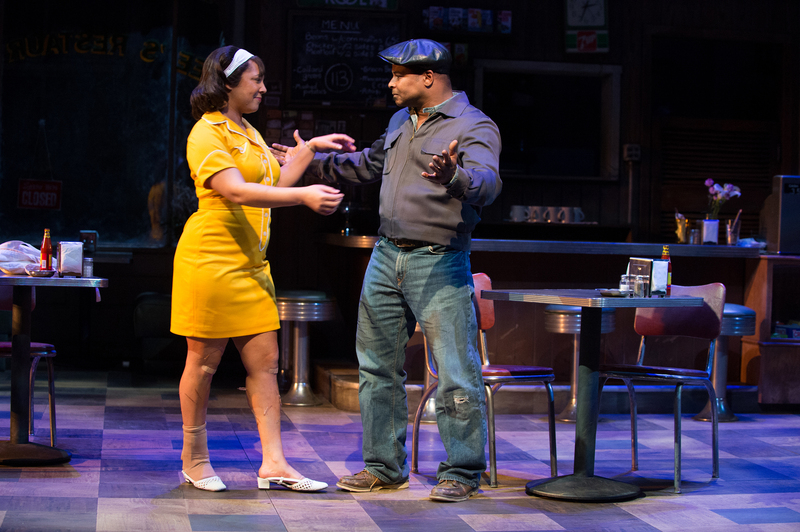 When the jukebox finally gets fixed, Sterling (Kevin Kenerly) asks Risa (Bakesta King) to dance. Photo by Jenny Graham. TWO TRAINS becomes a series of scenes and long speeches that have their moments. Wilson feels like a poet who happened to work for the stage, and the emphasis is on stories and long recounted tales, not on dramatic action. This type of drama is a different way of seeing. It is more deliberate and patient. It requires intense concentration from both the cast and audience. When it works, the air vibrates with the ring of truth, and you are transported into the histories being recounted. If you slip out of that wavelength, the experience can drag at times. With OSF talents like Kenajuan Bentley (who plays Wolf) and Kenerly in the house, there are several stunning visual moments here. Watching Risa (Bakesta King) slowly walk back and forth across the stage is an existential meditation on the silence (and enduring weight) of history. There is texture and possibility. There is authenticity. But there is not always a consistent animating force to keep the story moving down the tracks. Hambone (Tyrone Wilson) tries to get away from Memphis (Terry Bellamy) as Holloway (Josiah Phillips) and Risa (Bakesta King) watch. Photo by Jenny Graham.